Review: Psst! We are all conspiracy theorists. The 17th-century minister Cotton Mather believed Native Americans were “conspiring with [the Devil]” to dislodge white colonists. Today, the radio host Alex Jones asserts that a coterie of state actors is drugging President Trump’s Diet Cokes. 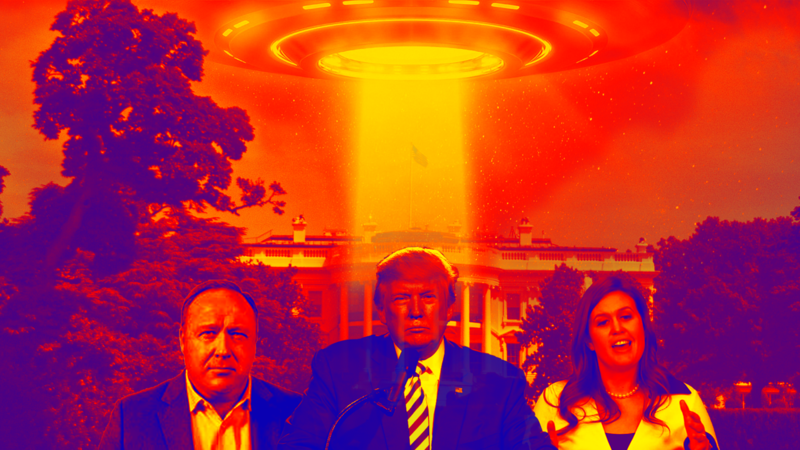 “While conspiracy theories are as old as the country itself,” writes the journalist Anna Merlan in her new book Republic of Lies, “there is something new at work: people who peddle lies and half-truths have come to prominence, fame, and power as never before.” They sit atop social-media perches and traverse the halls of 1600 Pennsylvania Avenue. Their influence wafts through the internet like a contagion through air vents. Before YouTube suspended his account last August, Jones counted 2.4 million subscribers. President Trump, a noted conspiracy theorist, commands an audience of nearly 60 million followers on Twitter (it is hard to know how many are bots). In 2019, fabrications and phantasms are legion, hole-punching your brain until it feels like Swiss cheese. In 2019, fabrications and phantasms are legion, hole-punching your brain until it feels like Swiss cheese. A book by QAnon, a right-wing conspiracy group, recently appeared on the Amazon bestseller list. (The book claims that Democrats run a trafficking ring and drink children’s blood.) Merlan dives right into these cesspools, interviewing conspiracy theorists on cruises to Mexico, at conventions in Los Angeles and Kentucky, and across the street from the White House in Lafayette Square. She writes with such acuity that I could not stop reading: Each page pops with bizarro details and characters. Supreme among the conspiracy theorists profiled here is the aforementioned Alex Jones, who has claimed that domestic terror attacks like the Oklahoma City bombing, the Boston Marathon bombing and the Sandy Hook massacre were government-sanctioned hoaxes, or “false flags.” (In February 2019, Jones was deposed in a defamation lawsuit brought against him by the Sandy Hook families.) These denials stem from a conviction that the attacks were “part of a string of assaults on right-wing patriot groups and had been staged to justify further crackdown on those groups.” Merlan writes that some conspiracists thought the suicide bombing at an Ariana Grande concert in Manchester, U.K., was a “false flag” planted by liberals to distract from the death of Democratic National Committee staffer Seth Rich. But paranoia is not always partisan, or even rooted in class. Merlan points to wealthy progressives like Robert De Niro and Robert F. Kennedy, Jr., who have aligned with the anti-vaccine movement. “To go truly viral,” Merlan writes, “conspiracies need a famous name or a big media outlet as an accelerant, the connective tissue that connects the fringe with the power players.” When Seth Rich died, WikiLeaks agitator Julian Assange gave an interview to a Dutch TV station in which he hinted that Rich was a WikiLeaks informant. Theories proliferated online, implicating prominent Democrats like the Clintons. But paranoia is not always partisan, or even rooted in class. Particularly distinct from the Trumpian brand of reactionary conspiracism are the suspicions minority communities harbor about their government. As a recent exhibition at the Met Breuer in New York showed, the government—often inclined toward opacity and poltroonery—has conspired against people of color, particularly African-Americans. Any account of conspiracism is incomplete without this history; Merlan devotes an illuminating chapter, called “None of it Is Crazy,” to the subject. To some extent, this is Merlan’s point. Crazy is relative. Conspiracies do happen. The Supreme Court swung a presidential election in 2000. The George W. Bush administration invaded Iraq under false pretenses. Russia circulated political ads on Facebook in 2016. Wells Fargo employees embezzled millions of dollars from unknowing clients. So long as the powerful—and the institutions they populate—lie and hoodwink, exploit and cut corners, people will be suspicious of them. But another question of the Trump presidency—one I’ve been preoccupied with—is: Do powerful people like Trump and Jones really believe the invective they’re churning out? Yes? No? Probably? Are they just trying to maintain their empires and hawk merchandise? Am I a conspiracy theorist about conspiracy theorists? Since this is a Trump hit piece, maybe the author should answer the question, is the Russian Collusion story a conspiracy theory? "Just because you are paranoid it doesn't mean they really are not out to get you." See http://bit.ly/2TQnhbR about this quote playing out today. I love Trump hit pieces. Who else on the surface of the earth deserves a hit piece more than the Orange Poltroon. However, he IS improving. On this last trip to Viet Nam, his bone spurs didn't act up. I'm getting my MAABFJ hat. You can't write a factual story on the current political situation without it being a "hit" piece on Donald Trump. Use of this terminology is designed only to suggest that the writer is somehow biased against Trump and is slanting his comments accordingly. A simple listing of Trump's lies and his latest outrageous comments is all that is needed to reveal this man's character and gross incompetence. To single out and laud one particular group shows bias. Of course, Trump's delivery is ridiculous. But there is always some truth lurking in the background of his theories. It's best not to dismiss them too quickly. Conspiracy theories are not what is preferred; they are simply a step on the way to discovery of the truth. At least some of us still have the courage to propose theories. Saying "I'm not convinced" is not enough. The success of America is its ideas. We innovate. They make it. We should strive to keep ideas flowing. It's amazing to see the somersaults of sophistry people will perform to defend Forrest Trump. There is nothing there. Nothing. He is the mere shadow of a human being. Not even a simulacrum. Well, your country elected him. It's not denigration. It's just being objective , truthful and exact. No doubt, the oligarchs are getting what they want except they would prefer a more velvet gloved front man. The Democrats may yet provide one. Whether Trump gets re-elected has nothing to do with me. Trump is still Forrest Trump. If they voted for this jerk before, they'll vote for him again. Rome had its Nero, Caligula, Elagabalus. Trump's reign, 4 or 8 years (or lifetime) will be one of the milestone markers of our decline. I want to thank you for your consistency.